MODERATOR:Jessica Musila, Executive Director -Mzalendo Trust. From the 1930s to the 1960s most housing estates built for African residence in Nairobi had social halls. Pumwani was built as a response to the 1921-1922 urban protests movement led by Harry Thuku. Later, With the growth of the civil service, other social halls such as Landhies, Ziwani, Kaloleni and Makongeni were built. The halls provided space for revelers to enjoy traditional music and other genres derived from international influences through media, the Second World War and travel. Some beats came from from South Africa, Congo and Cuba. Amidst these influences, something uniquely Kenyan was emerging. What were these national sounds that targeted a national audience? What was the role of the recording studios in the growth of Kenya? How did the earlier music express African identities? How was money made by musicians in the earlier days? How did musicians learn the art of music? 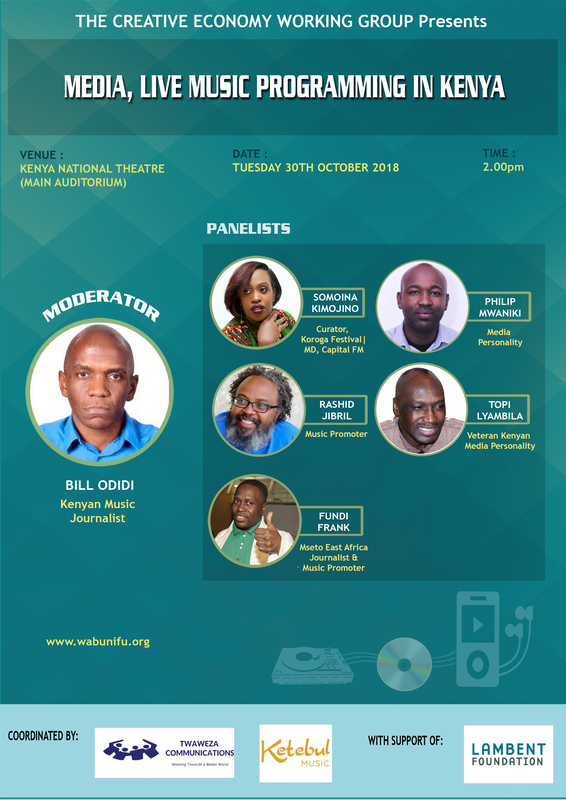 The growth of information technology has had a big influence on Kenyan music as Kenyan musicians interact with sounds, instruments and technologies from other cultures. Younger musicians are creating and producing music differently from the older generations. But how are they doing it? What can older musicians learn from younger ones? Conversely, what can older musicians share with younger one? 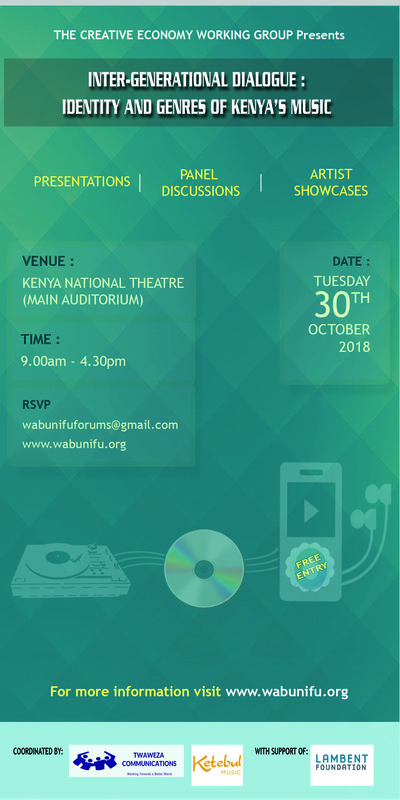 The Inter-generational Dialogue Forum on music organized by the Creative Economy Working Group is a knowledge sharing opportunity about the sector. 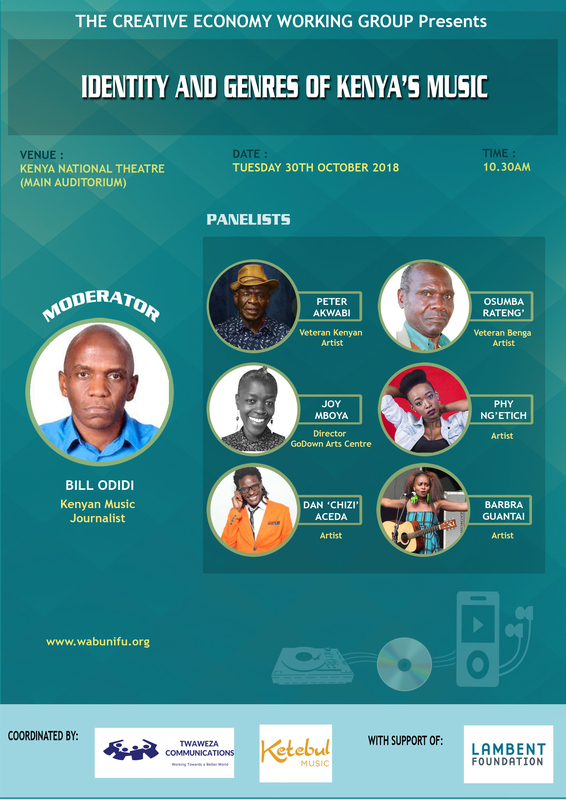 It is a conversation of what has been going on in the music scene in order to better appreciate the evolution of Kenyan music and to explore its future trends. 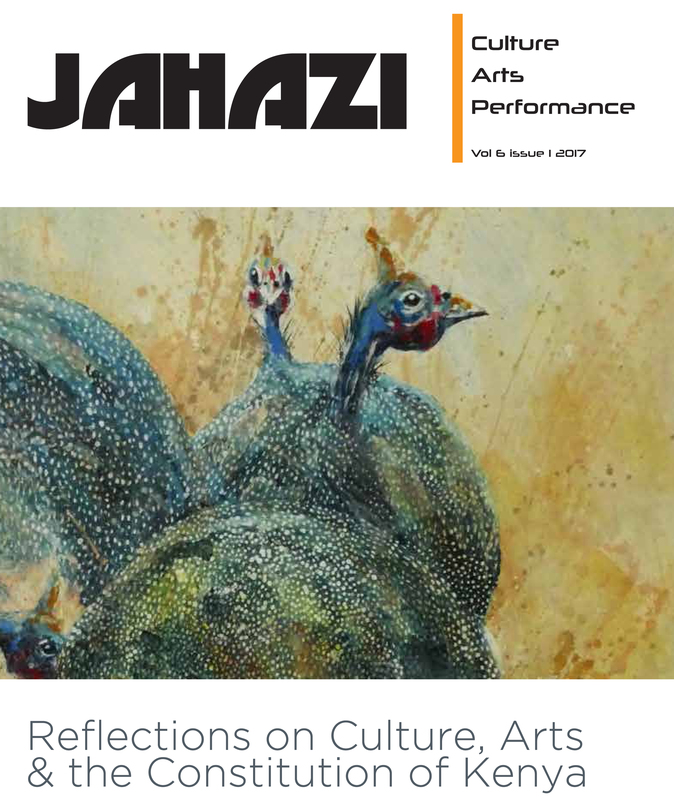 This issue of Jahazi delves into the recent events of this year such as the approval of the Culture Bill and the victory of the Ogiek community to protect their way of life. Contributors discuss the importance of identity especially in the wake of Brexit and Donald Trump, the role of food in culture, the Traditional Knowledge Act and we feature visual artist Paul Abwao. This is one of our most though-provoking issues to date. You can download it for free on the link below. 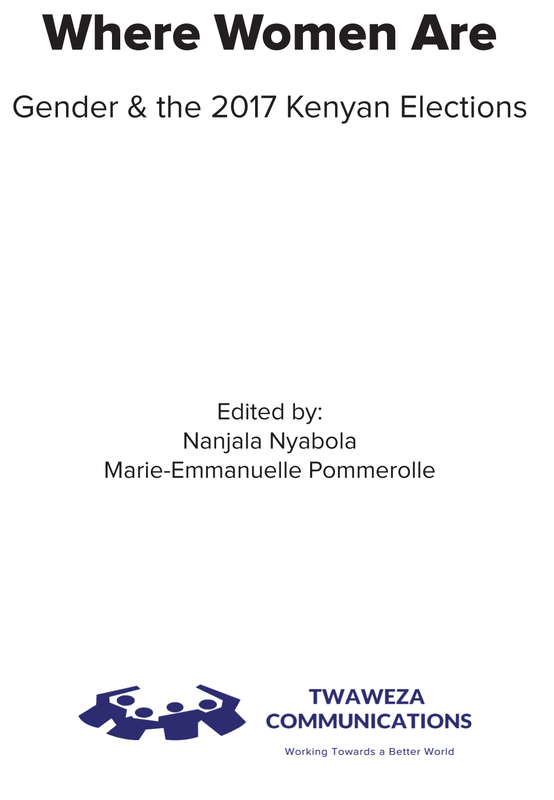 This book explores governance and women; lack of representation, intimidation of candidates, the faux choise between patriarchy and authoritarianism are just a few of the issues discussed. Download for free. You can download it for free on the link below. "With the exception of God and disability, Wahome Mutahi could laugh at anything in life. 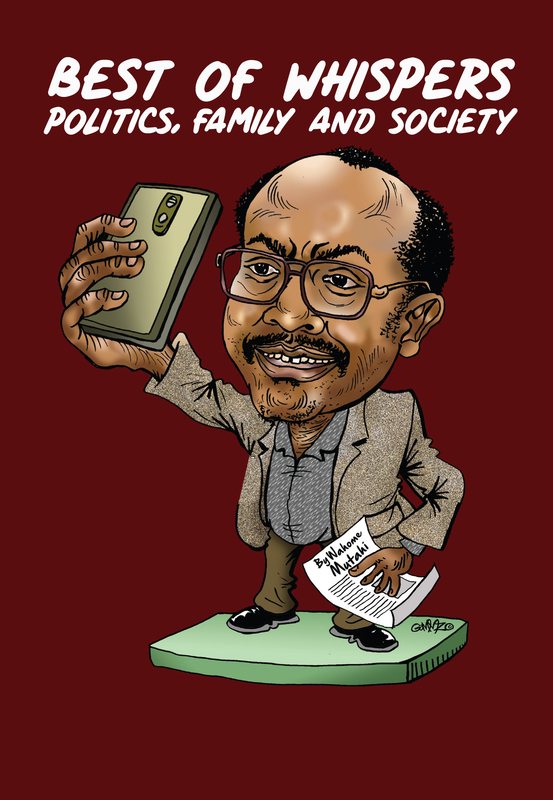 He laughed at society he laughed at the Government and he laughed at his family-but he laughed at himself the hardest. His writing was like an onion whose layers one could keep peeling for tears and laughter. There were those who would read it for the humour on the surface and those who would peel the first layer and weep a little that their consciences were coming calloused. At the core, there was a deep understanding of the culture and life of the people that Whispers wrote for and about. " We believe making the world a better place for future generations cannot happen by accident; it can only be done by persistent, consistent hard work by a group of forward-thinking citizens of the world. We record our experiences, upcoming events and activities to inspire you to join the Twaweza Movement. Together, we can make the world a better place.